“When you get to dock at The Grand Tremezzo, you will see someone tall and handsome waiting for you. Tell him I love him.” That was the request made to me by a hotel manager in the resort town of Bellagio, across the lake from the Grand Tremezzo in Lago di Como. His beloved son is a suite butler who was being sent to meet me at the dock outside The Grand Tremezzo. I arrived a day earlier prior to my scheduled press trip to get acquainted with the towns and the environment of Lake Como and met this delightful father in Bellagio. Lake Como is a most picturesque region, and I found it as warm and friendly as the request of me by this gentleman. 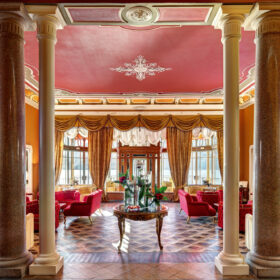 The Grand Hotel in Tremezzo feels more like a palace than a hotel—an extraordinary palace at that. Bordering the gardens of the Villa Carlotta, which rules over the best view on Lake Como, the hotel perches majestically over the famous lake. Even with its aristocratic feel, it does not have a stuffy environment. The setting is rather light and fun and filled with staff with only one goal in mind—to make the guests’ stay one that is blissful and relaxed. They will act on your wishes and even raise your desires and expectations. There are five different restaurants and bars within the hotel property, and each serves an exquisite Italian culinary experience. Under the direction of Italian Gualtiero Marchesi, referred to as “Maestro,” the cuisine is one of the spot-on hedonistic delights. Marchesi is known by many in the culinary world as the originator of modern Italian cuisine. In June 2008, Marchesi decried the scoring system of Michelin and gave back the stars awarded to him, publicly stating that he was only interested in receiving comments and ratings from his diners. Under Marchesi’s oversight, Osvaldo Presazzi is in his right an excellent chef, working his magic on a day-to-day basis and impeccably serving the flavors of the Lombardy region. His food, too, has creative twists on the traditional to the modern. Presazzi has an artist’s creativity and, frankly, he needs to, because his food is being served in one of the world’s most romantic settings. There just is no room for anything but excellence in this atmosphere. Whichever restaurant you choose during your stay—La Terrazza, L’Escale Trattoria & Wine Bar, T Bar, TBeach or even a wood-fired pizza at TPizza—you will never be disappointed. Just make sure that you walk in the steps of Greta Garbo and enjoy the views and food of the “La Terrazza” restaurant at least once. Trust me when I tell you that you will never forget it. Grand Hotel Tremezzo offers garden suites and rooftop suites as well as lake view rooms that will keep you awake staring out at the window’s scenery. I dare you to draw their elegant drapes to that view! You fall asleep to this view, and you wake to it before having your classic European breakfast on the terrace or in your room. I honestly felt I was in a fairy tale. Beautifully appointed in every way, relaxation is achieved by only turning the key. A soak in their enormous tubs can go a long way to putting you in a dream-like bliss. Strolling through the lobby only enhances your experience, and I don’t believe that can be said about many hotels or even resorts. The ever present roses will change from red to white, and the lighting as well changes with the times of the day. There is even a classic candy table for your enjoyment, waiting for you to indulge. The Spa at Grand Hotel Tremezzo is located down centuries–old stone stairs into a modern yet antique grotto setting. In the sanctum of the T Spa, the indoor large infinity swimming pool looks like a belt of sheer sapphire. A beautiful arched passage interconnects two other baths that open to more awe-inspiring views of Lake Como. The latest pool is the floating pool described as water-on-water, a floating oasis surround by sand and a fantastic bar. The floating blue just lays on the blue lake to create an optical feast to cool yourself in. While you are relaxing in the pool, the views of neighboring Bellagio are there to dazzle you. Another pool is Piscina dei Fiori (the pool among the flowers), which sits among the explosion of color that is Lake Como. Daydreaming in this relaxing setting can add years to your life or, at the very least, your soul, and I doubt any doctor (Italian or English) would ever dispute that. Exclusive access is now given to Grand Hotel Tremezzo guests to the extraordinary Villa Sola Cabiati. In the 1500s, Villa Sola Cabiati was considered the “pearl” of Lake Como. I thought of it as a “grande dame” or even a regal queen splendidly perched on a throne of a stunning natural landscape. Whatever the nickname, this is a symbol of the elegance of Lake Como, and now there is a union of Villa Sola Cabiati and the Grand Hotel Tremezzo. Guests are invited to explore and utilize this extraordinarily beautiful setting. Architectural lovers and history buffs will just be thrilled with all that there is to experience and learn. I could not stop thinking about what those walls have seen and how now we are encouraged to walk through the halls and gaze—or in my case, gawk—at the splendor. Until very recently, the villa was available for private use only. The marriage between the superb Villa Cabiati and The Grand Hotel Tremezzo opens the elegance of Lake Como’s past to the hotel guests for the most amazing of local experiences and occasions. Like the Serbelloni family, the original family, you can be your version of dukes and duchesses holding your event or reception within the walls of in the gardens. A trip to Lake Como would be incomplete without a jaunt around the highly scenic body of water that has drawn well-to-do Milanese to the region for centuries and now draws from the world’s discriminating travelers. Fortunately, the guests of the Grand Hotel Tremezzo can tour the area’s historic villas in style in the property’s boats. Skipping through the emerald waters by villas that hold the wealthy and famous is enjoyable to be sure, but the natural beauty of where you are in the world demands only awareness and gratitude. RUY and BATT are the Grand Hotel Tremezzo’s very own period Venetian motor launches at guests’ disposal to discover the Lake’s fairy-tale look in the most fashionable style. One-, two-, three- or even four-hour tours can accommodate six guests for a very affordable tour of the lake’s many charming expanses. As you would imagine, all tours come with Italian Prosecco to ensure traveling in style to places like Villa Balbianello, Isola Comacina, Laglio (for the Hollywood set’s hideaways), Villa Erba, and hidden gems of the northern part of Lake Como. Lake Como is a very different trip than most trips to Italy. It is not the bustle of Rome or the pace of gallery hopping in Florence or the crowds of Venice; this is a version of Italy to experience in an untouched elegant manner. 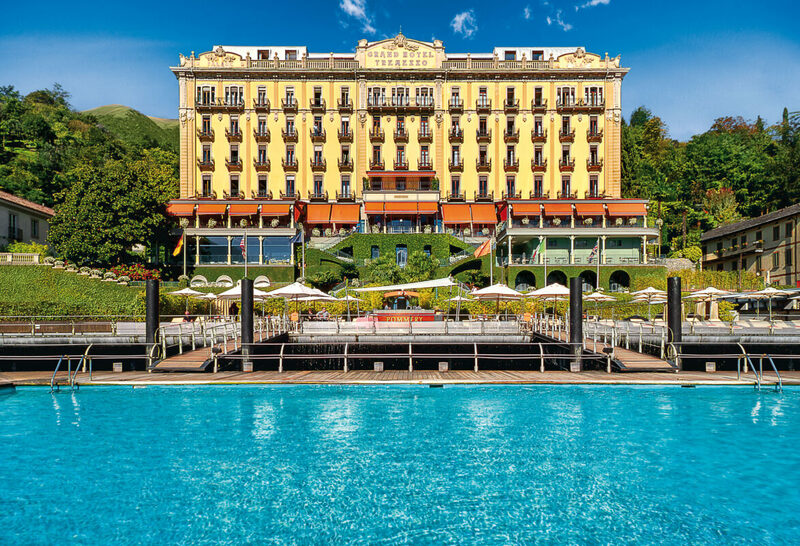 To experience Italy’s chic side, a trip to Lago di Como is a must, and a stay at The Grand Hotel Tremezzo is the only way to experience an old world dream come true. When you get to the dock in Tremezzo, you will find a tall, handsome specimen of beauty and grace standing before you. It is The Grand Tremezzo. Tell her that I love her and miss her until I return because she now holds a piece of my heart. Lake Como sits at the feet of the Alps in the Lombardy region of Italy. Known for years as a magnet to the wealthiest and those who seek a quiet and restorative getaway, Lake Como also has an amiable and warm atmosphere. It need not be for the rich and famous alone. It is stunning for everyone. The area does hibernate, it seems, until spring but when the flowers bloom, so can bargains on a vacation stay until the busy summer season sets in. Hotels and venues commanding the highest prices in summer are affordable for all in springtime. Lago di Como is made up of the towns Bellagio, Bellano, Colico, Griante, Lecco, Menaggio, Nesso, Tremezzo, Varenna and, not to be over looked, the city of Como. If you arrive by train, you find yourself in Como and, frankly, may overlook it on your journey to the well-known areas some distance away. It sits on the southwestern tip of the lake and is so much more than a passage hub. Plan to stay the day or two to explore Como before voyaging on. The restaurants, churches, piazzas all need to be enjoyed and appreciated. Each of the towns has its flavor. Bellagio – Situated at the junction of the lake’s two legs, this is an extremely attractive tourist town, with quaint streets for restaurants and shopping, which climb uphill except along the lake. Near the center of town and close to all the ferry docks, the Villa Melzi gardens there are gorgeous to stroll. When you walk gradually up into the gardens, you can marvel at the architecture and cobblestone paths throughout the town, as well as the natural beauty of the flowers and greenery within the gardens. Bellano – Located on the east side of the lake just to the north of Varenna, this lesser visited town features a pedestrian-only area in the center of town. Colico – Although the town may not appear to be as attractive as the others surrounding Lake Como, it is still worth visiting because of its views from the top of the lake. There is a historical World War I Forte Montecchio Nord that is open to the public once a week. Como – This is a wonderful stopping point before venturing into the more trendy lake towns. The lake’s main town, Como, sits where the southern and western shores converge with medieval treasures and comfortable streets to explore. Griante – Situated on Lake Como’s western plateau, this small village is well worth visiting because of its spectacular vistas out over the lake and the surrounding countryside villas. Lecco – Sitting at the southeastern end of Lake Como is the very appealing town of Lecco. Lecco should also include a visit to Lake Como for a relaxing cruise trip, lakeside walks, medieval narrow streets, and stunning restaurants. Menaggio – Located on the western shoreline, this attractive tourist destination is not as busy as Bellagio and Varenna. Nesso –This very small town is situated on Lake Como’s western leg, about halfway between Bellagio and Como. Tremezzo – Right across the lake from Bellagio is the beautiful little town of Tremezzo. The main attraction of the town is Villa Carlotta with its botanical garden and waterfront. Varenna – Across from Bellagio and Menaggio along the eastern shoreline is this beautiful town with its charming Villa Cipressi and Villa Montastero, which has attractive and relaxing gardens worth visiting. This entry was posted in Destinations, Experiences, Lodging, Uncategorized. Bookmark the permalink.